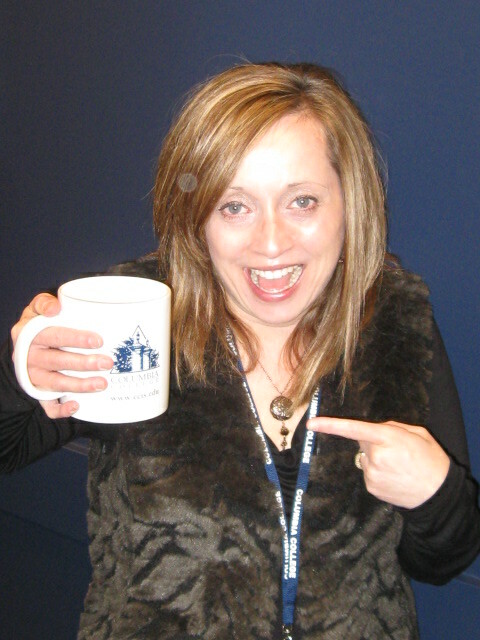 Debra Hartman with her new mug. Look at that mug! Imagine our excitement to learn that our very own Debra Hartman, director of Columbia College of Missouri-Crystal Lake, won the coveted Columbia College soup mug in the first ever Connections Trivia Contest! (Connections is the monthly employee newsletter.) When asked to guess how many trees were on the grounds at Columbia College’s main campus in Columbia, Mo., Debra estimated 687 trees. That’s only 27 off from the actual number of 660. Way to go, Debra! No one can take this victory away from you. Enjoy that mug! "No one can take this victory away from you." I want to repeat the same words Debra! :) The mug seems to be pretty big, lol! A BIG BIG CONGRATULATION TO YOU DEBRA! That was an incredible guess!